Köken Ergun is an artist preoccupied with the body’s performance in the public sphere. In his video works, Ergun has explored weddings, national celebrations, beauty pageants, and religious ceremonies, his interest lying in communities’ social dynamics. While in the earlier videos, Ergun chose to be a somewhat distant observer, he seems to be more ‘visible’ in the recent works: he participates in the ceremony (Wedding, 2006-8), he speaks with his subjects, (Binibining Promised Land, 2009-2010), he turns his camera between the ritual and its backstage (Ashura, 2012)—all implying that his seemingly neutral camera affects and changes his subjects, and these social encounters alters the artist in return. Below is İlhan Ozan’s take on the Ergun’s most recent solo exhibition at SALT Ulus in Ankara. Here, Ozan focuses on the four earlier works that deal with the performative, or rather theatrical bodies whose gestures and behaviors seek to meet “the conditions of belonging” to an identity, and ultimately to a community, as he puts it. Exhibition view of Köken Ergun’s “Crowds and Power” at SALT Ulus, Ankara. Photo by Cemil Batur Gökçeer. SALT Ulus hosted Köken Ergun’s one-person exhibition, Crowds and Power between December 5, 2013, and February 16, 2014. The exhibition focuses on rituals of various social groups and subcultures. 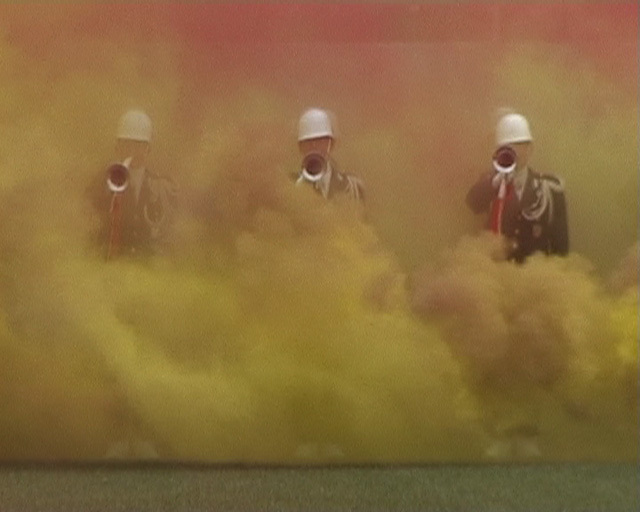 While using performance and video as a medium, Ergun’s works are constructed on his extensive research on different social groups and cultures including Turkish weddings in Germany (Wedding, 2007), the Ashura commemorations of Caferis in Istanbul (Ashura, 2012), beauty pageants organized by Philippine immigrant workers in Israel (Binibining Promised Land, 2009-2010), and military ceremonies that take place on Turkey’s official holidays (I, Soldier, 2005; The Flag, 2006). With this exhibition, Ergun questions the negative impact of authoritarian power on individuals and crowds with wit, revealing awry mechanisms within social structures. The exhibition also reconsiders the history of the Republic of Turkey through contemporary events that display the formation of national identity and identification, a performativity that entwines the individual acts into a larger social context such as April 23rd, National Sovereignty and Children’s Day; May 19th, Commemoration of Atatürk, Youth and Sports Day, and the headscarf issue. The artist investigates these activities through the perspectives of diasporas, differences, nationalism, and secularism, and observes the formation of common identities and performative representations. One of the most striking pieces in the exhibition is titled Tanklove (2008). 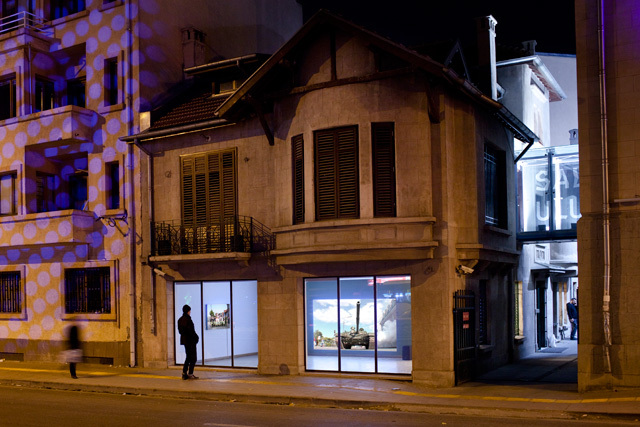 This video work was screened on the ground floor of SALT Ulus, and could easily be viewed from the main road through the glass on the front side of the gallery space. 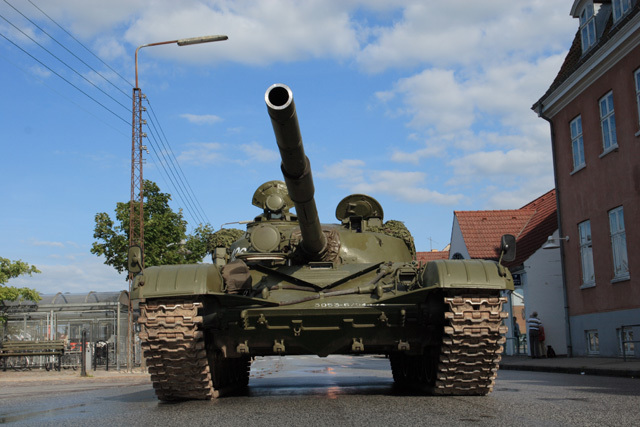 In the work, the viewer sees a tank entering a small Danish town, Jyderup, rolling over the streets. The situation is obviously quite unusual for the locals. While they encounter an unusual scene in their daily life, it is far from resulting in real effects; people react to it as a kind of play. However, the departure event of this work is quite “real” in the context of Turkey, which inspired Ergun. The military past of Turkey is well-recognized with its military coups. Turkish military seized power in 1960 and 1980, and also forced the resignation of governments in 1971 and 1997. However, it is not only in the times of military intervention that military control mechanisms are in charge, but also in the everyday, civil life that is penetrated by this influence. Nevertheless, as for Ergun’s generation, including myself, “the 1997 military memorandum,” also called a post-modern coup, has more “real” connotations. If we pause to remember what happened briefly, it is relevant that the National Security Council (MGK), the leading actor of the coup attempts, and the decisions issued by the Turkish Military leadership on a National Security Council meeting on February 28th, 1997, initiated the process that precipitated the resignation of prime minister and the end of coalition government at that time. First of all, it should be noted that this event takes place in the streets of Sincan district of Ankara, the capital of the Republic, so the exhibition and this work are charged with a particular symbolic importance by being at display in Ankara, referring to the actual event. The exhibition building, SALT Ulus is located near the modernist projects of the Republic such as Museum of the Republic, Theatre and Opera Exercise Scene, Youth Park (Gençlik Parkı), State Art and Sculpture Museum, and many other bureaucratic buildings and institutions of the Republic. The location of the exhibition strengthens its context and its propositions. Secondly, one might ask what the purpose of attempting to recreate such an event in a welfare state such as Denmark where democracy seems to function without problem, or at least military fractions are quite weak would be, in contrast to Turkey or any other developing countries where the quasi-military imposition of reforms and military violence have been a natural part of everyday life and politics. Both the real event in Turkey and the work produced in Denmark share a theatricality. What gives such a dimension to the aforementioned event in Turkey is that it happens as a kind of play that the tanks are sent out to show the power and the influence of military on the politics in the country. The event happens early in the morning, and therefore is missed by some journalists. It is thus repeated the same day for the other journalists who couldn’t catch the performance. It may seem absurd at first glance but becomes meaningful when one considers the intention of the military, which is to show military’s existence in Turkey as the guarantor of the secular republic and to broadcast this as loudly as possible. Therefore, I think the primary relationship between Ergun’s work and the event that inspired it can be formed through the theatricality. Secondly, Ergun’s work draws attention to the current state of Denmark as a welfare state, and asks what would happen if this were to change one day. There may not be a reason to think in the current state of Denmark that the society may evolve into weaker democratic conditions, temporarily or permanently, but that does not negate the possibility of it. In fact, isn’t it the function of art to evoke possibilities? The theatricality of the real event is referred to also through a photograph hung in the same room of the exhibition space, complementary to the video work. In the photograph, the contributers pose at the end of performance for a souvenir. Though the photograph is not intended to be an explicit reference to the real event, one can draw parallels through the context that the real event was also planned and put into action accordingly, just like the artist’s decision to realize his work. It is up to audience to imagine who would be in such a frame if the same pose was given to journalists in the real event. 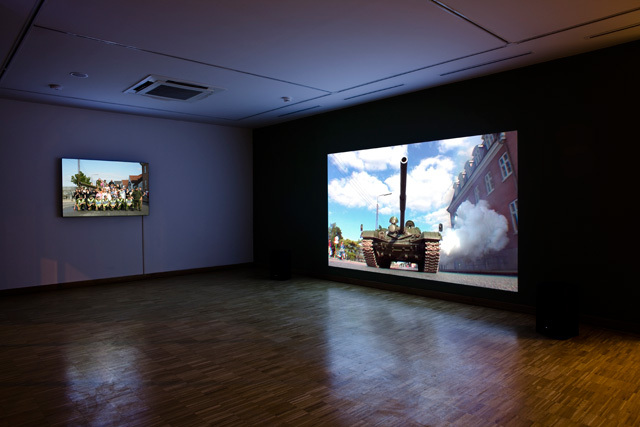 There is another work in the exhibition, whic is closely related to I, Soldier: a video titled The Flag (2006) that the artist shot at April 23rd, National Sovereignty and Children’s Day celebrations. It follows an idea similar to the national celebration of May 19th and may be viewed as an earlier stage in bringing up children with nationalistic ideals. In both of these works, the discursive and non-discursive structure of the event shapes the individual acts in relation to the specific context of the events. In the pursuit of these works, a body politics is problematized regarding the formation of identity that can be conceived through performativity. Within this frame, Ergun’s works explore most importantly why body is located in the center of this, beginning with childhood. Physical military force as pointed out in Tanklove is not the only means, nor it is sufficient to establish and maintain nationalism and military power. Citizens must have a representation of nation in their minds, which acts as a mental image of their affinity, since a nation is a socially constructed community in a larger scale. This requires to construct and perform a common identity around certain values and norms. Ergun, with I, Soldier and The Flag, inquires into the construction of identities as they are constantly formed by performative actions, behaviors, and gestures which present “conditions of belonging.” A condition of belonging supposes that people gather around a common identity. Thus, “conditions of belonging” appear to be a requisite for an identity and so that the subjects of a particular identity come together through the interior norms of that identity. However, what is critical is that there is no interior truth, no inner essence in identity. Truth is closely linked to the system of ordered procedures for the production, regulation, distribution, circulation, and operation of “statements.” It should be sought in a circular relation with the systems of power in which truth is produced and sustained. In such a system the “regime of truth” is established. Every society has its own regime of truth, its “general politics” of truth, and Ergun’s works tend to reveal the construction of the truth in the specific context of Turkey. Moreover, what is observed in Ergun’s works are all these acts are not solely performed by individuals. There is the production of cultural signification for bodies in the context of identities. These acts are caused by discursive power and always already constructed in relation to larger social contexts. Performativity emphasizes the ways that create and shape an identity through discourse. From a particular view of performativity, “performative acts are types of authoritative speech”  which is enforced through the law or norms of society. Accordingly, the formation of any identity presupposes a set of cultural references which provide performative acts the necessary base to act upon. In this construction, discourse stands together with the formation of identity, not only as a mere language but also as performative acts. “The power of discourse to produce that which it names is…essentially linked with the question of performativity. The performative is thus one domain in which power acts as discourse.”  By looking at the examples of May 19th and April 23rd in Ergun’s works, the audience witness ‘repetition’ as a fundamental part of performativity. It is also seen that an act is being rehearsed and turns into a reality through repetition. As this pattern is repeated, people begin to see it as natural through “anticipation,” “repetition,” and “ritual.” Nationalism becomes “performative” in that it is productive. From the point of performativity, an identity is seen as an effect rather than a cause. “For an identity to be an effect means that it is neither fatally determined nor fully artificial and arbitrary.”  This body politics is observed in Ergun’s early works. In Untitled (2004), a 8’54” video work, the viewer watches Ergun as he covers his head with different headscarfs one by one. His confident movements gradually break down as he battles with conflicting positions. By departing from the growing discussions on the headscarf issue and nationalism, the artist expresses his personal protest against conservative secularism, embodying the stress on the body which is attempted to be kept under control by different ideologies. One of the critical constituents of this work is the headscarf with the moonstar motif as in the Turkish flag. It points out another important subject of debate in the history of the Republic, as one of the conflicting domains in society that the religious symbols were attempted to be removed from the public sphere. All of Ergun’s works have a common characteristic that they are not simply produced in the artist’s studio and then being exhibited. All the performances—let it be his fiction as in Tanklove, or the recordings of celebrations and rituals as in his other works—bring up the question of public art in the sense that performance and public events appear as a process which is embodied in the works. Furthermore, Ergun’s works vary widely; they don’t only include the issues such as ideological state apparatuses which I discussed here, but also different social groups and subcultures as well as the interactions and dynamics of social conclaves. However, my discussion about the four works points to a distinct part of Ergun’s artistic practice. They are important from the point of view that they deal with the social, cultural and political past of Turkey from the prism of contemporary issues as well as Turkish society and the national and cultural changes it has undergone. And they often reveal the complicating borders, surfaces, embodiment, and boundaries—thus exposing different layers of performativity over bodies. Posted in content, on artists and tagged Özge Ersoy, Crowds and Power, I Soldier, Köken Ergun, SALT Ulus, Tanklove, The Flag, Unknown, İlhan Ozan. Bookmark the permalink.